- Data Logging and Image- / Video- recording the way you never experienced before! The all new light weight “RC Logger PRO” combines data and image capturing into one device allowing synchronized telemetry data and high density imaging collection during flight. The integrated data bus connects up to eight sensor modules (optional available) in series allowing to capture precise GPS data, temperature probes or current flow, system voltage, atmospheric pressure and altitude, humidity, single cell status, motor rpm and other telemetry data. Please refer to the product page for currently available and future available add-on modules. The RC Logger PRO can be triggered manually or automatic, in both recording modes (video & still image) allowing to assign a free RX channel to connect to the RC Logger PRO directly. Minimum photo trigger interval is 1 second. The trigger interval can be set by the user via the powerful RC Logger Viewer PC software. If the included trigger cable is connected the RC Logger PRO will be powered by the RC -helicopters / -airplanes / -cars on-board power system. - All new FPV and OSD support! The RC Logger PRO offers full FPV and OSD support and provides video and audio signal output for 5.8 GHz high resolution video transmission. 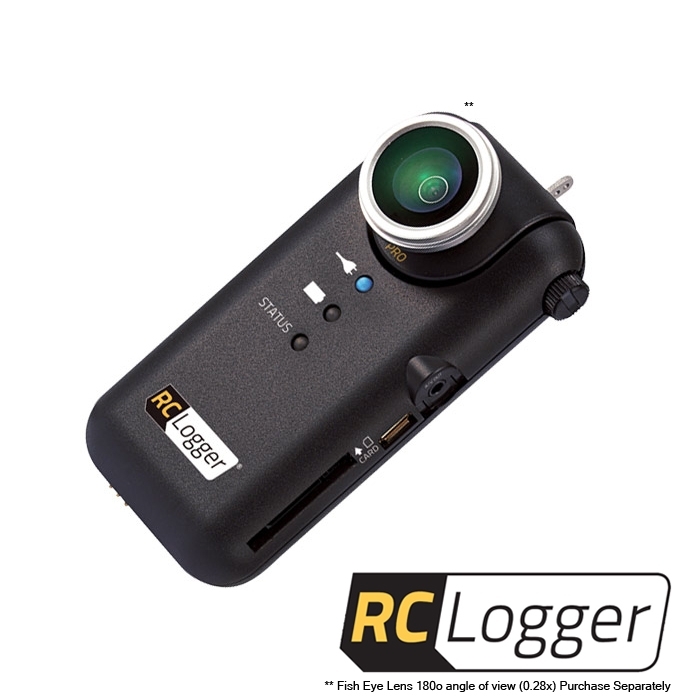 The RC Logger PRO allows various camera and image quality settings including exposure and white balance as well as auto mode. The user is able to select from different resolution and quality modes to optimize the video-/photo recording and data logging based on the specific needs and environmental conditions. - All new recording without limits! 32 GB fast SD/SDHC card support for around the clock recording. Enjoy longer recording time limited only by the size of SD card used and available power (external power source supported). Single video files now support 4 GB file size. If video is recorded beyond 4 GB video files will be split in multiple files automatically. - Get a wider view of your life! A lens mounting ring is pre-installed allowing to attach RC Logger´s smart lens system including a fish eye-, telephoto conversion- and wide angle lens for stunning video- and photo- recordings. The RC Logger HD/PRO uniquely synchronizes video- and still image- recording with all recorded telemetry data. The powerful RC Logger Viewer PC software allows viewing the collected data in perfect sync. View your world in 3D with Google Earth plug-in support. Compare with RC Logger HD2.